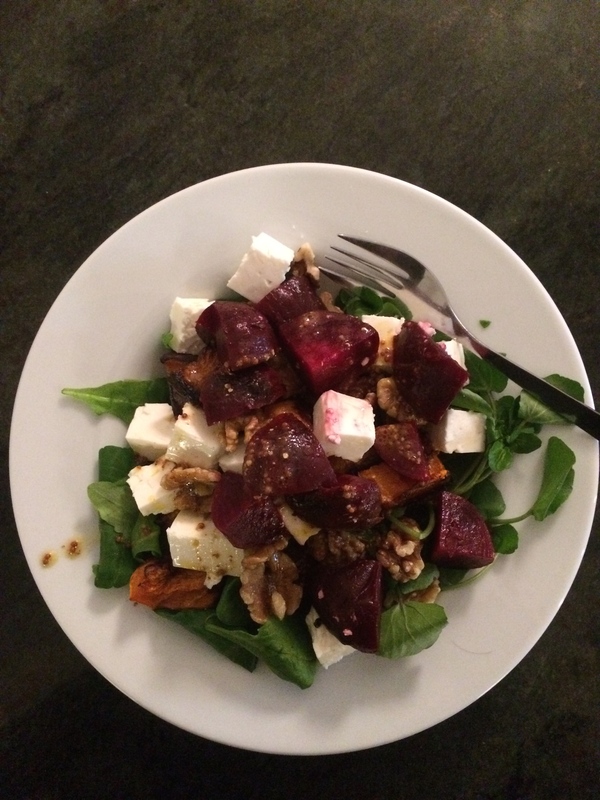 Here’s a super healthy winter warming salad to enjoy anytime of the day. Not only is beetroot great for boosting stamina and making muscles work harder, it also contains potassium, magnesium and iron as well as vitamins A, B6 and C, and folic acid. Beetroot can also reduce blood pressure and the risks of heart attacks and stokes. Although it has a ‘medium’ GI (Glycaemic Index) of 64, It has an extremely low GL (Glycaemic Load) of 2.9 which means it’s converted into sugars very slowly and therefore helps to keep blood sugar levels stable. Beetroot’s iron content means it’s good for those with anaemia and fatigue. Preheat the oven to 200C/fan 180C/gas 6. Scatter the butternut squash wedges over a shallow tray drizzle with 1tbsp of oil, the chilli flakes, if using and the thyme. Season with freshly ground black pepper. Toss to coat and roast in the oven for 20 minutes. Add the beetroot and walnut halves then return to the oven for 8 minutes. Meanwhile, whisk together the vinegar, remaining oil, mustard and some black pepper to make a dressing. Tumble the roasted veg and walnuts into a serving bowl. Add the salad leaves and crumble over the feta, then drizzle with the dressing, carefully tossing to coat. Serve warm.